It's a sad fact that for the second time since I started this blog, I find myself writing about the loss of a wonderful dog. 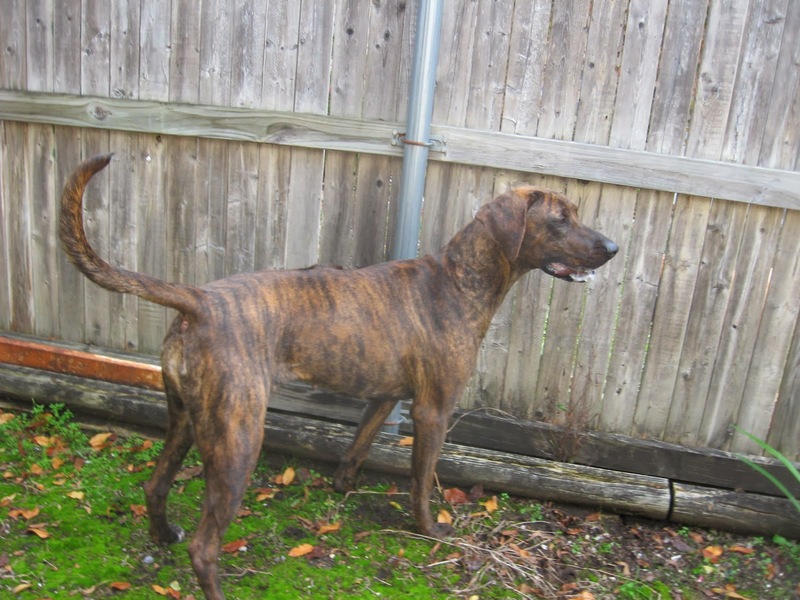 Finn and his late, great buddy Asa are featured prominently, well, everywhere in my life. They were my designated office assistants and mascots, their image is my computer screen saver, and photos of them cover many of the walls in our home, along with photos of the horses that have also been such a big part of my life. Asa succumbed to cancer on August 20, 2012 (see blog entry for 10/01/12); not long ago we also lost Finn, to a different type of cancer, leaving, for the moment, only the small white dog you see hogging the larger bed in the photo above. Finn was okay with that; he was that kind of guy. 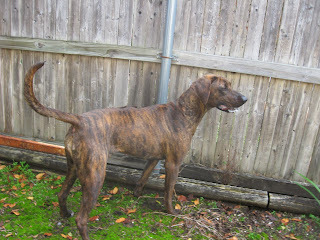 His absence has left a rhodesian ridgeback-sized hole in our lives here. And if you knew Finn, you know that's a pretty big space. We miss him. I've been away from here for way too long. 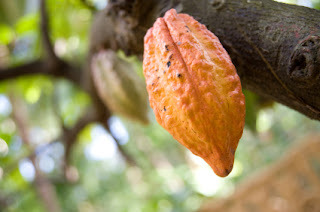 Very busy finishing my next book, which, as I mentioned in an earlier post, is all about chocolate! The research has been yummy. I'm finishing revisions and getting together some great photos for the book, which will be out from Houghton Mifflin Harcourt in the spring of 2015. As soon as it's ready to go, I'm getting to work on the next book, which will be, so fittingly, about dogs. And about humans, and humans and dogs together, evolving. I'm very excited about it. The title is The Dog in the Cave: Coevolution and the Wolves Who Made Us Human. Also from my wonderful publisher, HMH, and due out in 2016. 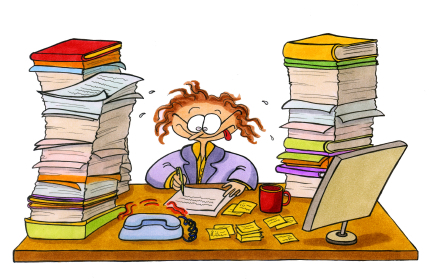 That seems like a very long time from now, but I know I'm going to be working like crazy to meet my deadlines. 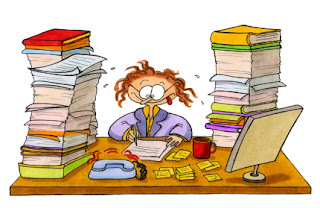 It's going to be fun, though, and I'll once again have two very special office assistants who should inspire me daily. I'll keep you posted. I'm sure I'll have a lot more to say about dogs, dog breeds, and the wolves from whom all domestic dogs are descended as I get into this book! 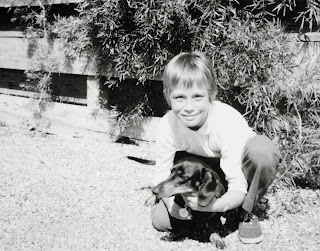 And just to round out the dog theme, so much on my mind these days, below is an old photo of me and my first dog. Her name was Lady, she was (as you can probably tell) a little dachshund, and we lived in Florida. She was my best buddy then. For a long time, I thought I had no photos of her, and then some old family pix unexpectedly came into my possession. This one brought back a ton of memories. I think Mimi looks contemplative, don't you? (though she may need reading glasses, judging from how close her nose is to the page!) Those Big Sky mustangs from Montana are definitely something to think about. Especially in light of this video story that appeared (in the New York Times) today, which you can find here. If you're interested in background on the problem with wild horse populations that I wrote about in Wild Horse Scientists, checking out this short (under 10 minutes) video would be a good start. It includes some amazing footage from the original wild horse legislation days in the early 70s, and shows how it was a huge effort by the iconic "Wild Horse Annie" and legions of concerned kids who made it happen. Now it's time to look at where we are today, and some of the unintended consequences of that humane legislation. 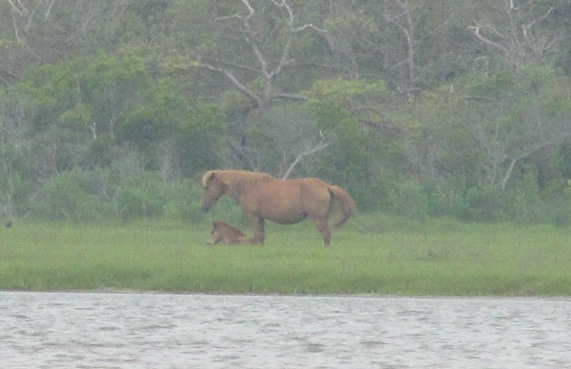 And one more thing: I heard from National Park Service ranger and wild horse specialist Allison Turner today, and she sent a kind of blurry, distant photo (from about a half mile away) of the newest foal on Assateague Island (see my post from last month), spotted by Allison just today. Ta-da! You saw it here first! Meanwhile Carol's Girl, the wild horse mom extraordinaire who has thus far managed to thwart all efforts at contraception, has not yet delivered this year's foal. But Allison says Carol's Girl has been very grumpy with the rest of her band lately, which probably means the time is soon. Stay tuned! Winter has settled in here in south central Pennsylvania, with frigid nights, cold days, and just enough snow on the ground to remind us it's February. But T.J. Holmes is accustomed to serious snow where she lives, in southwestern Colorado. She's a journalist/photographer, blogger, and volunteer advocate for a herd of wild horses living in the BLM's Spring Creek Basin Wild Horse Management Area who has come to know the horses well, and who documents their wild lives through the seasons. She is also an expert shot with a PZP dart rifle, having been trained by Dr. Jay Kirkpatrick, and in cooperation with the BLM, she is authorized to dart Spring Creek mares to help keep the size of the herd within manageable limits. So today, I'm honored to introduce T.J. who has been kind enough to write a guest post about her work with the Spring Creek Basin mustangs. As an extra bonus, she's shared several of her wonderful photos. Thanks, T.J.! My now-10-year love affair with mustangs, specifically Spring Creek Basin mustangs, started in a newsroom. The editor asked the newsroom at large if anyone was interested in writing about them. My hand shot into the air – alone. The mustangs exceeded my skeptical expectations in every sense. They were stunning. Gorgeous in a way that was matched by their magnificent backdrop. WILD. A photo I took that led the story showed the romance: wild horses galloping into the sunset with the La Sal Mountains dominating the skyline. Since then, I’ve spent most of the last several years trying to dispel romantic myths while balancing my passion with reality. Are you kidding?! Ask 10 horse people how to do something, and you’ll receive 20 different answers. Just one way to do something with horses? That was an unacceptable answer. Within a month of our roundup, I learned that official was very wrong, and the seeds for new, better management for our Spring Creek Basin mustangs were planted. First, I attended the roundup at Little Book Cliffs Wild Horse Range, near Grand Junction, Colo. There, the only thing similar to our roundup was that a helicopter pilot herded the horses toward a trap site. But there, volunteers from Friends of the Mustangs helped BLM officials bring the horses calmly into a series of small pen, one family at a time. There was room for about four bands, and when the pens were filled, the roundup was done for the day. Then, because of extensive documentation by volunteers, particular horses were removed quietly and easily – AND THE REST WERE RELEASED. That was a huge moment for me. For our small herd (at close to 120 horses in 2007, almost double the population it should have been, according to our appropriate management level), the roundup took three days. Ten horses were released on the fourth day, and the remaining horses were divided into two other groups: one bound for the adoption event and one bound straight for Canon City, where BLM has a short-term holding facility within the prison complex. Conclusion: The horses captured on the first day of our roundup were held four DAYS. The first horses captured that day at the Little Book Cliffs were held for about three HOURS. 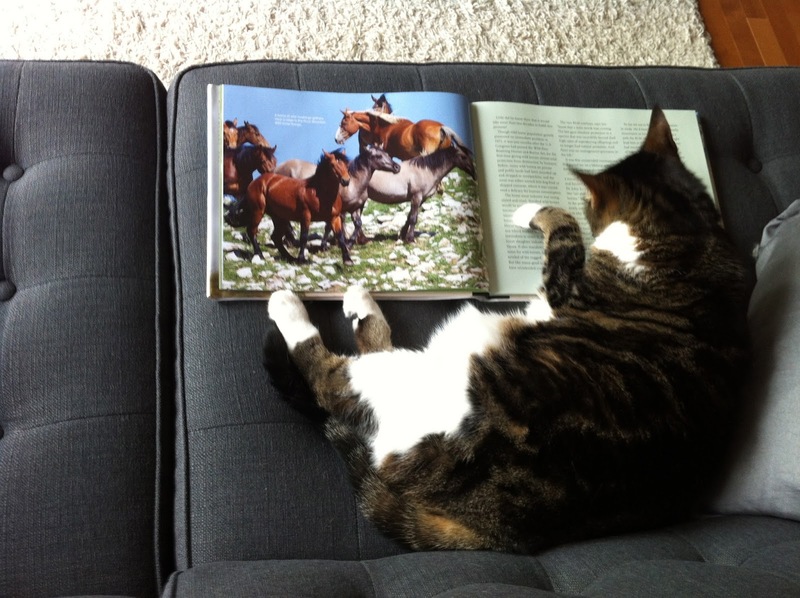 Documentation of the horses was key to making that happen. Second, I visited Pryor Mountain Wild Horse Range in Montana and Wyoming. There, I met Matt Dillon, then the director of the Pryor Mountain Wild Mustang Center in Lovell, Wyo. I had corresponded with him before I went and knew my education was about to take a leap forward. Matt went through PZP training in the winter of 2009 with Dr. Jay Kirkpatrick at the Science and Conservation Center in Billings, Mont. In the summer of 2010, I followed his example. At the time, we didn’t even have a green light from our BLM officials in Dolores, Colo., to start a PZP program in Spring Creek Basin. “We” is the National Mustang Association/Colorado chapter. All the original founders since have left, but two people who joined the board shortly after its formation, Pati and David Temple, still are on the board today. In early 2008, Pati and David were two of the founding members of Disappointment Wild Bunch Partners, a coalition of groups that includes NMA/CO, Four Corners Back Country Horsemen and Mesa Verde Back Country Horsemen. Our goal was to bring all our voices to BLM as a single strong voice. In 2011, with new management in the local BLM office and a roundup looming, BLM approved the implementation of a fertility control program using native PZP. We were ready! NMA/CO had sent me to Jay’s training and paid for my darting rifle. Training with Jay was incredible. I did a lot of homework before I attended in order to write our PZP proposal, which was submitted in the spring of 2010. 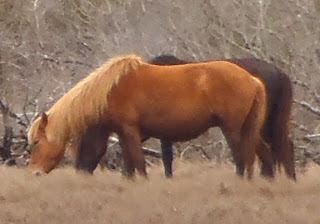 I was in contact with Jay before I attended the training, courtesy of one of my friends with Friends of the Mustangs (Little Book Cliffs herd). Interestingly, this person – and everyone else I had talked to – held Jay in such high esteem that he had become a rock star to me, someone to be admired, from afar. The idea that I could actually TALK to him had me shaking in my boots. When I finally gathered my courage and contacted him, I said as much. His response: “Ask me anything. I don’t bite.” When I finally met him, I might have freaked him out in my rush to give him a big hug! For making such a difference in the management of our wild horses, I can’t begin to thank him enough. This winter will be the second season of darting in Spring Creek Basin. We won’t know until this spring how successful last year’s darting was – until the treated mares DON’T have foals. It’s important to know that nothing in the natural world is 100 percent, and it doesn’t happen overnight. A mare’s gestational cycle lasts 11 months – in effect, a year. A couple of months ago, I told Jay that of the 10 mares we darted, only one – a 2-year-old filly – had changed bands. That’s pretty natural. So much for the hype that PZP will cause mass chaos and upheaval among the bands because the mares continue to come into heat every month. As of now, only one other mare has changed bands. In fact, more mares that were not treated have changed bands. The reaction to being darted has been nearly uniform: They trotted off a short way, then went back to grazing. 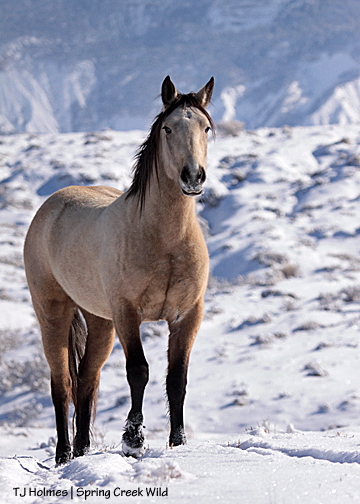 It’s important to mention that we don’t want to stop the population growth of the herd in Spring Creek Basin but rather slow it, with the goal of limiting roundups and the number of horses removed – which is necessary to enable the range to sustain a healthy population of mustangs – in favor of in-the-wild management. Also, we hope BLM will move from helicopter-driven roundups to bait trapping, as was successfully done on Pryor Mountain last year. And now a word from Dr. Jay Kirkpatrick! It's 2013, already. Happy New Year to all! 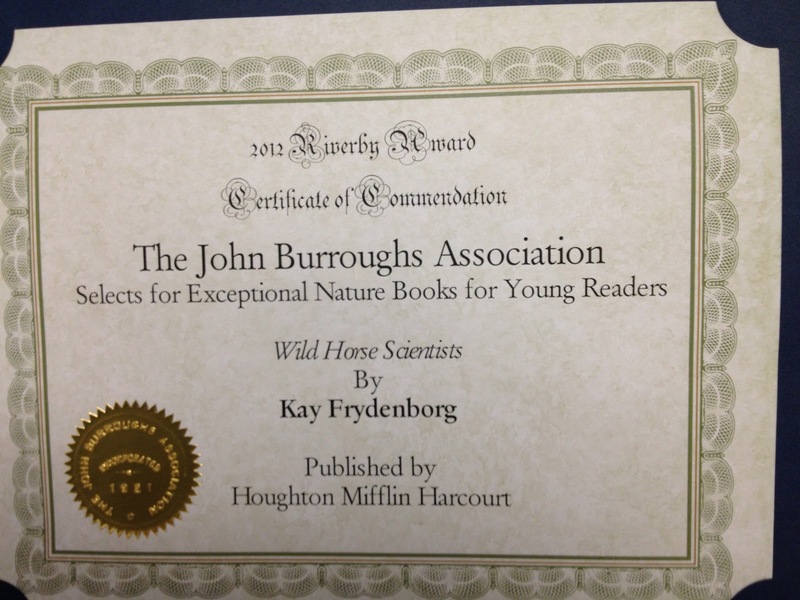 I've been busy with new projects, but I'm so pleased to hear from a lot of people that they're enjoying reading Wild Horse Scientists. 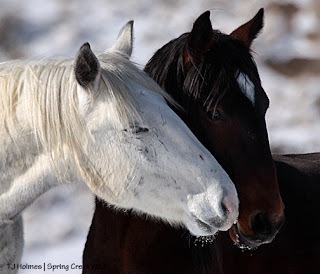 One really great thing is that I've gotten to know (in the cyberspace way) T.J. Holmes (see December post below), who writes a wonderful blog here about some wild horses in the area of southwestern Colorado where she lives. This sagebrush desert land has the wonderful name (for a storyteller like me) of Disappointment Valley, but to the BLM, it's also the Spring Creek Basin Wild Horse Management Area. T.J. chronicles these wild horses in words and lovely photographs, but she's also actively involved in work that may help to ensure their continued survival, because as one of Dr. Jay Kirkpatrick's trained army of volunteers, she darts selected mares of this herd with the contraceptive vaccine PZP. 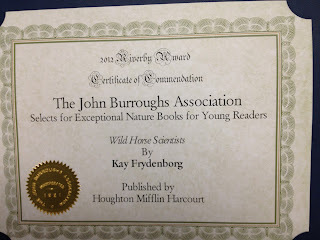 Another exciting thing is that T.J. is working with others to help educate young people about the dilemma of wild horses in the western U.S., and was therefore happy to discover my book. It could be a good teaching tool for middle schoolers, so I'm grateful to have made this connection with T.J. Look for a guest post from her soon! But in the meantime, I'm pleased to give you a guest post from Jay Kirkpatrick, the scientist responsible for the success of PZP. Wild horses in America are the center of a complicated, hotly-debated controversy, and he has written eloquently of that dilemma elsewhere. He could write a book on this subject (and I think he should! Actually, he did write one, back in 1994 (Into the Wind), which I highly recommend if you can find it. It's lovely and informative. But here is a brief update from Jay, director of the Science and Conservation Center in Billings, Montana, developer of the PZP vaccine. Thanks so much, Jay! The work of the Science and Conservation Center (SCC) is focused on the non-lethal control of wildlife populations, through fertility control, with particular emphasis on horses. To that end the SCC produces the vaccine and trains people to use it properly. 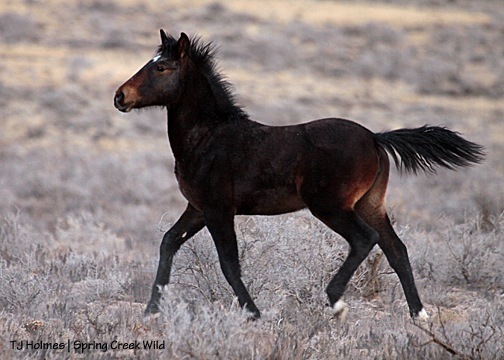 Certain wild horse populations are being managed through fertility control for the National Park Service, the Bureau of Land Management, the U.S. Forest Service, wild horse sanctuaries, preserves, and various Native American tribes. Use of the fertility control vaccine PZP for wild horses has increased slowly over the past 25 years, but not as fast as it might have, largely because of the social, cultural, economic and political forces that oppose this approach. Often who uses the vaccine and who doesn’t depends on the progressiveness of thinking among local wild horse managers, and less on policies. This places much of the work for moving this form of management outside the purview of science. 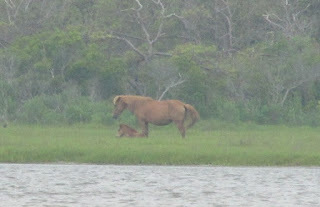 The SCC also manages some urban deer populations, many zoo animals, free-roaming African elephants and bison with the contraceptive vaccine and it is interesting that this world-wide effort had its birth on the marshes of Assateague Island National Seashore so many years ago. The SCC also engages in some research activities. One project is the testing of a recombinant form of the vaccine (rZP) as an effective booster inoculation. If rZP works, it will expand the ability to treat many more animals. 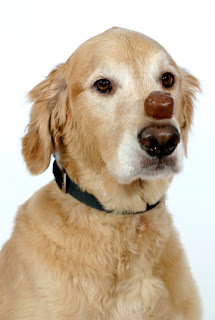 Production of the native PZP at the SCC is a time consuming, labor-intensive endeavor and if the rZP works, the SCC would only have to produce primer doses (the initial dose) and that would increase dramatically the number of animals that could be treated. Other research includes species’ differences in the response of the PZP vaccine. For example, some recent research shows that it is much more effective in species of the goat and sheep families than in other mammals. But, wild horses will remain the primary focus of work at the SCC.